They say a picture’s worth a thousand words, but this one just begs for an explanation. Yes, those are our chickens. And yes, they are perched on the bathtub. Last fall we lost several of our chickens to an overnight skunk attack. (I didn’t post anything about it because it seemed unimportant in the of other events at the time.) Matthew and I spent the next day skunk-proofing the hen-house to ward off any future attacks. While the hen-house is now skunk-proof, we have discovered that it is not raccoon-proof. Thursday night we lost one hen and one chick. We initially thought that this was the work of the skunk, too, since we found a place where the wire had come loose. Saturday morning we discovered the door to the hen-house wide open with all five remaining chicks nowhere to be found. After fixing the broken door (more on that in another post) and thoroughly checking the hen-house for any other holes, we decided it was safe. Oh, did I mention that we had severe thunderstorms (no local tornadoes) and torrential rains with flash flooding Wednesday through Saturday? Saturday night around 10:00 pm I heard squawking from the hen-house so I ran outside in the pitch dark in my sock-feet yelling for Todd to come out there as I ran. When I got out to the chicken pen it was too dark to see anything. (It’s around the side of the shed from the house, so the porch light did no good.) I was yelling and the chickens were squawking, when all of a sudden I see something streak past me toward the house and I realize that it is one of the chickens. By this time Todd has gotten out there, but we still don’t have any light. I went back inside to get a flashlight and discovered the chicken that streaked by me (Pecker) was in the dining room–smart chicken, she knew where she would be safe. I yelled for Maggie to get up and go help and ran outside with a light. We determined that all of the hens were safe and whatever had attacked was gone. We found a place where the raccoon (which was kind enough to leave a telltale pawprint) had ripped several boards off the side of the hen-house. There was also a place where Pecker had ripped off the screen in her determination to get away from certain death. Around this time the adrenaline starts to wear off and I realize that I am soaked almost to the knees (and still in my socks) from running back and forth through the ankle-deep puddles in the backyard. Todd and Matthew were outside trying to patch the hen-house in the dark. Maggie was inside trying to find Pecker (who had decided the dining room was still a bit to exposed for her taste and had hidden behind the piano). 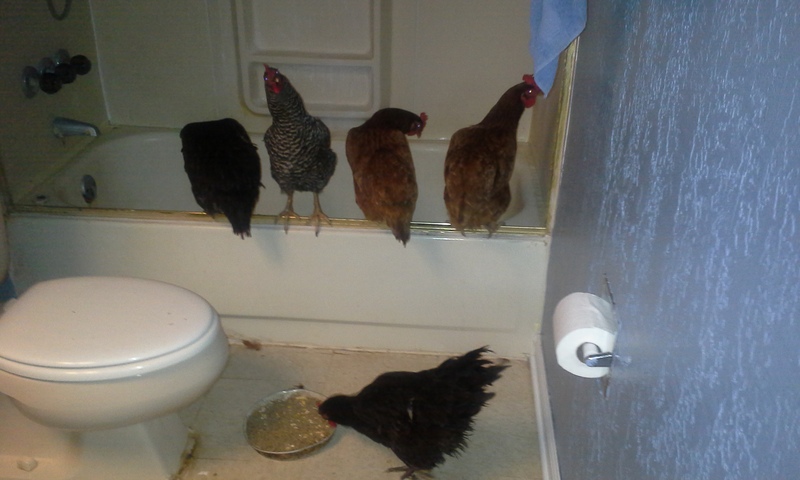 I realized that I would never get to sleep wondering if chickens were safe out there, so I decided that they could sleep in the bathroom for the night. Surprisingly, they settled right down and we didn’t hear a peep out of them all night.